This is not your lunch lady’s Salisbury steak recipe. No. Not by any means. In this Salisbury steak recipe, we pair grass-fed beef with earthy oyster and shiitake mushrooms, fresh thyme and mineral-rich homemade beef stock. It’s a luxurious dish – rich and robust. For a woman who lives food, dreams food, revels in food like I do – there’s a handful of dishes that evoke powerful memories, memories so strong one can almost relive them in tasting the dish. Preserved lemons and home-cured olives bring me back to my summer in Morocco – whitewashing a children’s center, traveling the ridge of the Rif mountains in a teetering old van. Just a sniff of cherry-flavored Jolly Ranchers or black licorice-flavored jelly beans, and I’m sitting at the worn wooden table in my grandmother’s Long Island kitchen. And Salisbury steak takes me back to the grade school lunch room, to science fairs and playing Red Rover during dusty and hot recesses. And then, a second memory comes. I’m in college, poor like all college kids – spending money on books and booze, bagging groceries at the supermarket until midnight when I’d settle in for a microwave supper. Banquet made the cheapest and I could usually buy one for under $1.50. Oh how it makes me cringe now; though, in all fairness, it made me cringe then, too – and I eventually gave it up to vegetarianism (another bout). Let me tell you now, texturized vegetable protein and vegetable broth does not a Salisbury steak make. Of course, I learned quick to ditch the processed soy and resolved to eat a whole foods vegetarian diet – lentils and beans, grains and vegetables. Oh, but what was I thinking!?! How I wish I had learned about the dangers of soy and read the Weston A Price Foundation’s guided tour for vegetarians before I found my young body (already challenged by pharmaceuticals for a decade) riddled with autoimmune disease, thyroid disease and infertility. I’m joyful, near blissful to have come full circle in a celebration of traditional foods. I know better than to deny my body the nutrient-dense foods it craves – even butter and fresh cream and whole raw milk. I have my reasons for eating red meat, and I cherish my local ranchers who nourish my family and our collective land with grass-fed and pasture-raised meats. Their work, and the work of other ranchers practicing holistic management, greatly improves the variety and health of local fauna and sequesters carbon in the soil where it belongs. The animals need the land, and the land needs the animals. We humans? We need both. 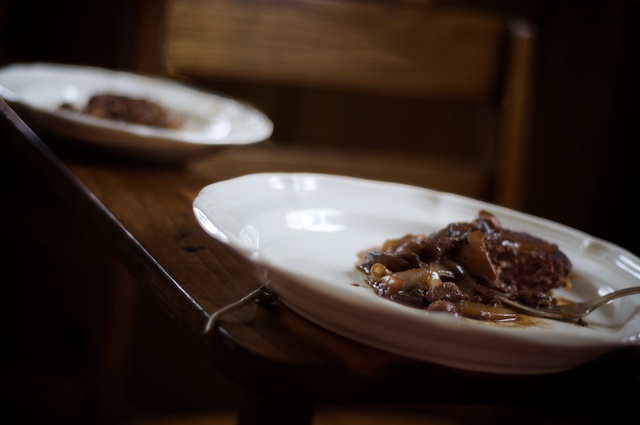 In this Salisbury steak recipe, we season grass-fed beef with shallots, onions and wild mushrooms before searing and tenderly simmering it in mineral-rich broth. This gentle practice which imparts moisture to the final dish makes up for what some cooks consider grass-fed beef’s shortcomings: namely, that its leanness makes it tough. 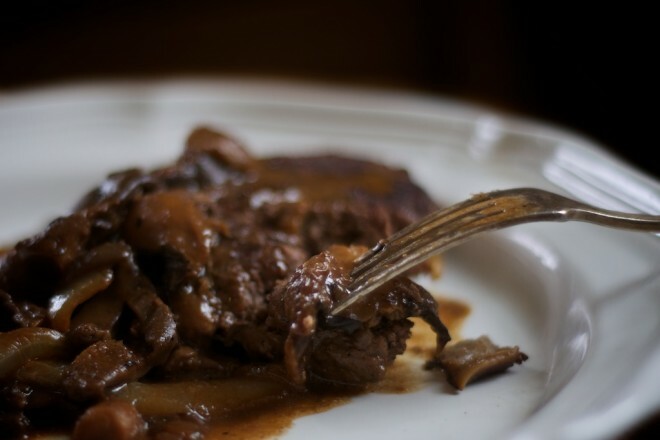 On the contrary, grass-fed beef can be wonderfully tender – particularly so when it’s slowly cooked with plenty of good quality broth or wine as called for in this Salisbury steak recipe. It’s in this Salisbury steak recipe that all my memories of the dish are rejuvenated and given new life if not forgiven entirely. A far cry from those pallid grey masses of meat smothered in lumpy gravy dished up by the lunch ladies of my childhood, this Salisbury steak is robustly flavored, deeply fragrant and utterly satisfying. And those Banquet frozen dinners and vegetarian steak’s of my college years? I’ll forgive them if you do. They were naïve whims on a journey to real food. 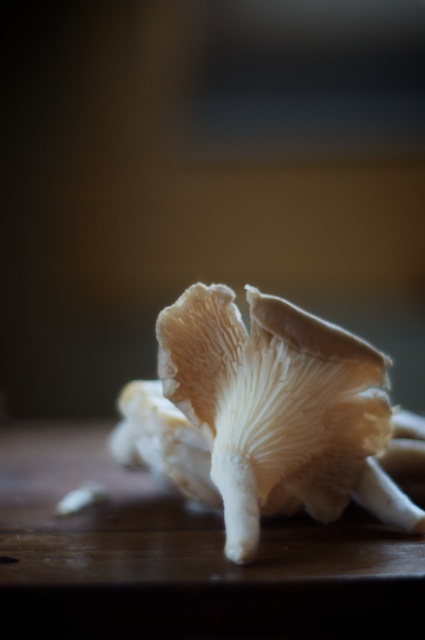 And in this grown-up version, we celebrate the richness of the land from grass-fed meats to earthy wild mushrooms – oysters and shiitakes are my favorite, but use what you can find or forage. 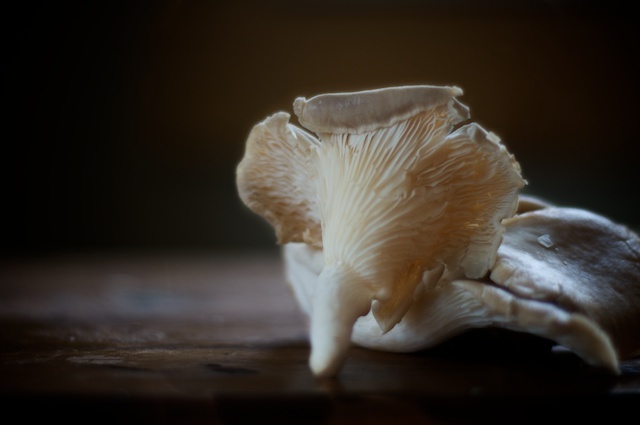 As for my family, we’ll be ordering up a few boxes of spores for DIY mushroom lovers – growing our own oysters, trumpets, portabellas and shiitakes in no time for this Salisbury steak recipe and for mushroom stew, wild mushroom butter and other dishes that fit our fancies. Fragrant with the woodsy perfume of wild mushrooms, red wine and caramelized onion, this Salisbury steak recipe elevates a humble dish from pallid and pasty meat served in grade-school lunchrooms of your childhood to the divine. 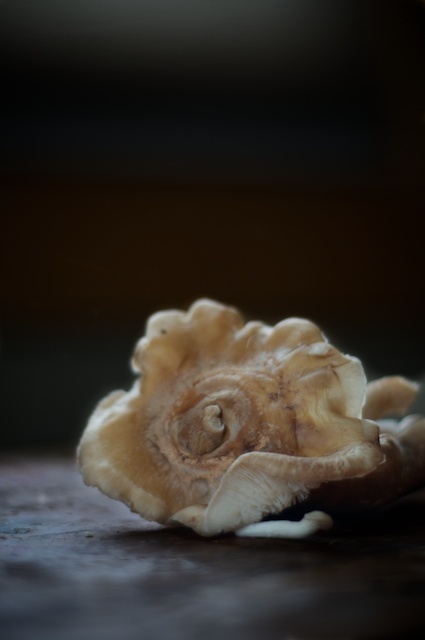 Are you a wild mushroom lover? Serve a crusty piece of whole-grain sourdough bread smothered in wild mushroom butter alongside this dish. Toss ground beef, minced shallots together in a mixing bowl and stir to combine roughly. Fold in beaten egg, salt and pepper. Continue stirring the meat, seasonings and egg yolk together until the mixture is thoroughly combined. 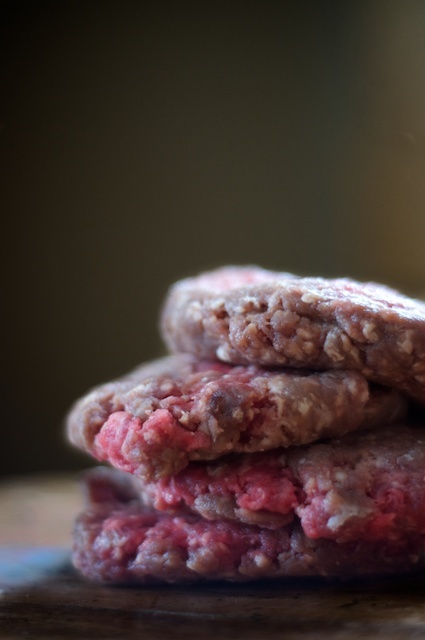 Form the seasoned meat into four patties and set aside while you begin preparing the mushroom and onion reduction sauce. Bring beef stock, red wine and fresh thyme to boil over a moderately high flame. Continue simmering until reduced by half to three-quarters. Melt two tablespoons clarified butter in a cast iron or stainless steel skillet over a moderate flame. When the butter is frothy, but not yet browned, toss in onions and fry until they release their fragrance and their edges begin to caramelize. Remove the onions from the pan, and toss in the mushrooms, taking care not to overcrowd the pan. 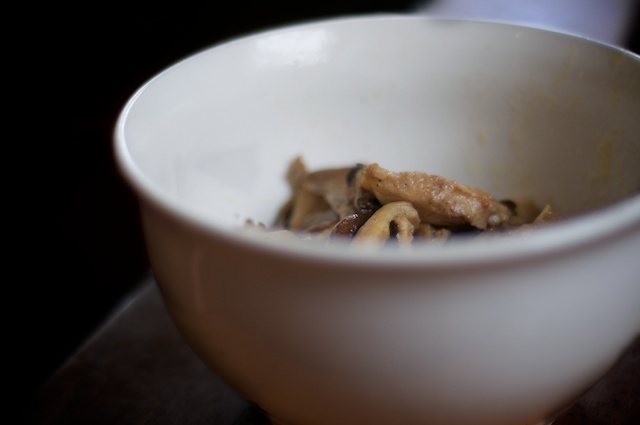 Continue sautÃ©eing the mushrooms until fragrant and brown. Set aside. Melt two more tablespoons clarified butter in the skillet and add the salisbury steak patties to the hot fat â€“ searing on both sides until nice and brown on the outside but still pink in the center. Smother with sautÃ©ed mushrooms and onions. Once the wine and stock are reduced by half to three-quarters, remove and discard the sprigs of thyme. Whisk in two tablespoons butter and continue simmering for one to two minutes. Pour the reduction sauce over the Salisbury steaks, mushrooms and onions. Continue to simmer over a moderately low flame until the steaks are cooked through. Serve hot, with pan sauce. How timely! My 5-year old was just asking for “meat balls in my favorite sauce”, which was originally a salisbury steak recipe. And I was wondering if she could be satisfied with something that wasn’t based on ketchup and french onion soup from a can. I’ve just discovered your great website and I’m glad that I have! Awesome stuff. YeaH School was some trauma for all of us… it’d be totally dope to revisit SalisburySteak in this form. This looks OUTSTANDING! Definitely one I’ll be trying out with my fresh order of grass-fed beef! Thanks so much and I’m so glad I stumbled on this recipe today! I’ve made this a few times. It’s a favorite! We love it! This recipe looks wonderful and I can’t wait to try it, but do you actually spend almost $50 a bottle for wine that you use to cook with? Yikes! Oh no! Not at all. I wonder if I posted the wrong link on that site? They have $$$ wines, but I use their advance search to find 90+ rated wines under $25 that are sustainably grown. I cook with what I serve with dinner. Wow, I have a pound of ground beef and a pound of mushrooms at home that I need to cook for dinner tonight. What a coincidence! So glad to find this link in my in-box today – sounds like the perfect dinner for tonight. Salisbury steak is one of my husbands favorite and we just bought a box of mixed mushrooms at the farmer’s market. Perfect! This is a great recipe – I really appreciate the new (to me) techniques it demonstrates. I grew up in a beef-and-potatoes household, but one where plain, salted, steak was always cooked well-done and almost always barbequed. It took years for me to learn that it doesn’t have to be overcooked, for one, and that other flavors, toppings, and sauces can be added, and add to the nutrition. Love the photos, too. It reminded me to call my grass-fed beef farmer. I love this post, Jenny! This was posted awhile ago – so maybe you’ll never even see this – but I loved it! I smiled and smiled and nodded ‘oh-yeah…sounds familiar’ the whole way through. The things we wish we’d known…..but I have to say, know that I’m wiser, and trying to guide my own daughters, it’s no easier. They don’t much care – just ‘gimme’ a bag of bar-b-que potato chips’ and ‘mushrooms are just so…mushy’. Sigh. More for me. Have you played with larger quantities? Does the sauce need to increased at the same proportion as the patties? I actually just doubled this recipe for meals this week. I had to eyeball some ingredients, because they would have been too much, had I actually doubled it. For example, I ended up using 2 large shallots as opposed to doubling the recipe to 4 shallots. I think it would have been too much, and it turned out great that way. I did double the sauce, and it was a lot of sauce, but we didn’t mind it honestly! We poured it over some potatoes, and it was really yummy! I made this and it tasted great, especially the reduction sauce. Served it with mashed potatoes, steamed broccoli and homemade rosemary garlic bread. Would also be good with a nutty brown rice. Perfect meal on a chilly, windy day. Thank you for posting it. I’ve made this recipe twice and my family is requesting a third round. This one made it into the recipe box. Thank you! My daughter is allergic to eggs, any thoughts on omitting or substituting? I am going to plan to make the sauce with vegetables in a slow cooker today, then add the steaks with some veggies later. My husband will be working late tonight and that way we can have our meals still fresh. I used store-bought organic beef broth and ended up with a reduced but very liquidy sauce – which makes sense because I do realize that none of the “good stuff” (collagen, etc.) is left in store-bought broth. I decided to add arrowroot powder and the pan drippings to the reduction and it was alright. This is not a reflection on your recipe but an indicator that I didn’t use the proper ingredients to do this recipe justice, so I just wanted to warn those who may not make homemade bone broth that this may happen. I still enjoyed it, but think I will need to serve it with a gravy instead in the absence of homemade beef stock. Thanks for all of your valuable information and recipes here on your lovely website!